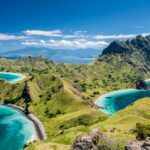 Java travel blog — The wonderful backpacking trip for exploring Java Island, Indonesia - Living + Nomads – Travel tips, Guides, News & Information! The best reward you get after attempting to reach the volcano’s peak is the chance to witness imposing blue fire that is created by ignited sulfuric gas. 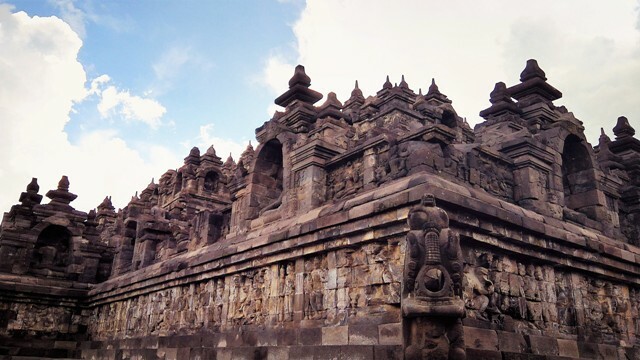 This is also one of the most impressive experience during the journey to discover Java. 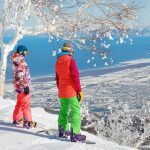 Mount Fuji day trip blog — How to spend one perfect day itinerary in Mt Fuji? 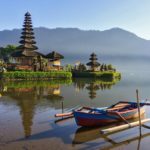 Although not the main tourist hub of Indonesia, Java holds a good range of natural jaw-droppers that tend to be overlooked due to the attractive force of the neighboring island of Bali. 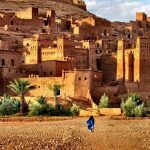 The country’s third largest island boasts a population of over 141 million, which makes it the most populated island on Earth. That doesn’t mean that you’re up for an overcrowded city trip. Flying into Yogyakarta is an easy way to avoid the crowds in Jakarta and sets you up at a great starting point. 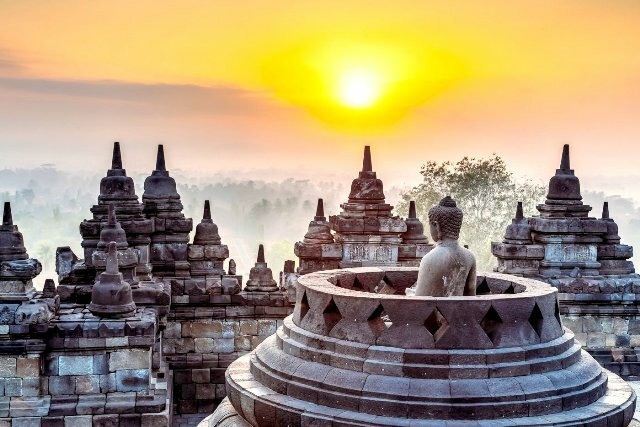 In Yogyakarta, we paid a short visit to the renowned Borobudur temple compounds. 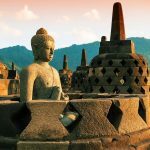 Built twelve centuries ago, it has remained the largest Buddhist temple in the world and has been recognized by UNESCO as the world heritage site. Don’t forget to amaze your taste buds by ordering some chicken satay from one of the many friendly street vendors while in the Yogyakarta. Java is considered the best place in all of Indonesia to try the dish. 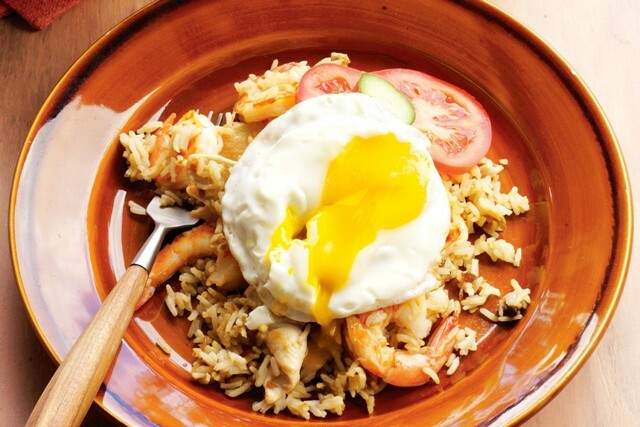 The Indonesian version of fried rice is called nasi goreng, and is also a dish you can’t skip. 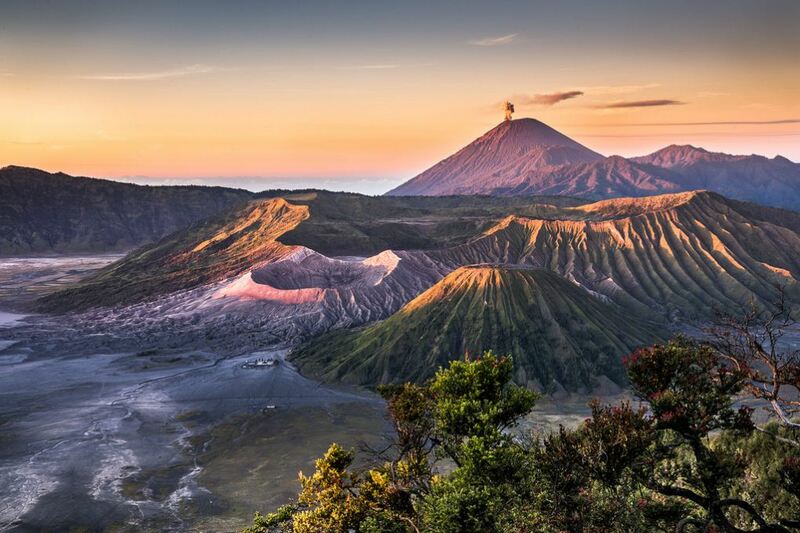 The next logical step from Yogyakarta is to head east towards Mount Bromo, part of the Tenggen Massif. Although cars and buses will get you there, we rightfully assumed the train would to be the most comfortable form of transportation. Even though it took up a good amount of our day, the seats were comfortable, and we were lucky enough to be seated in a rather empty and very quiet cabin. Trains will get you no nearer than the city of Probolinggo. From there you would have to hop on a bus or van to get closer to the volcano, which is a windy but not uncomfortable hour and a half ride. Tours to the viewpoint and the foot of the volcano generally start from 3AM. A jeep will pick you up from your hotel to bring you there. 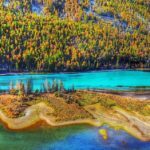 Note that there are a limited amount of hotels and guest houses, so during peak season you might want to make your reservations well in advance. Another option is to walk to the viewpoint. Needless to say this will take you a good while longer, so you might want to set your alarm as early as 1AM, as we did. It is important to know that there are two different viewpoints. 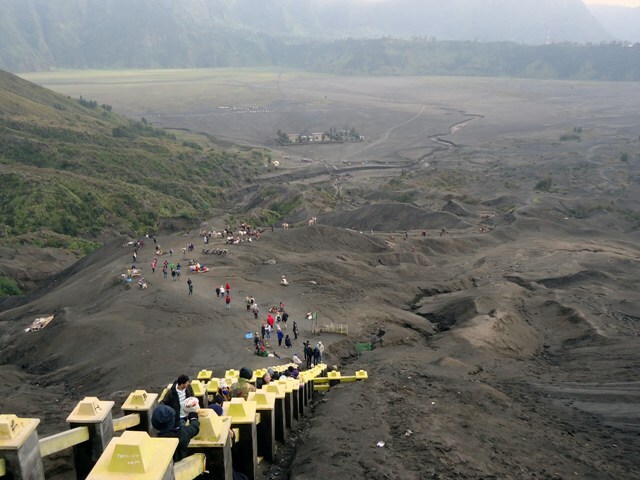 The one where most tour guides will take you is the newest one, from which you can take beautiful pictures of Mount Bromo. We went for option number two, which tends to be much quieter, more peaceful and equally beautiful, but also requires a short walk uphill. Leaving early will allow you to see the sun rise from behind the mountain range in the distance and watch the clouds fade away around the volcano, which is an amazing sight. Early morning is also the time of day when the volcano is the most active and as made evident by the thick smoke billowing in the air. For the photography fanatics among us; it makes for a great time-lapse video. Set up your camera, sit down and enjoy the view while Mother Nature does all the work. 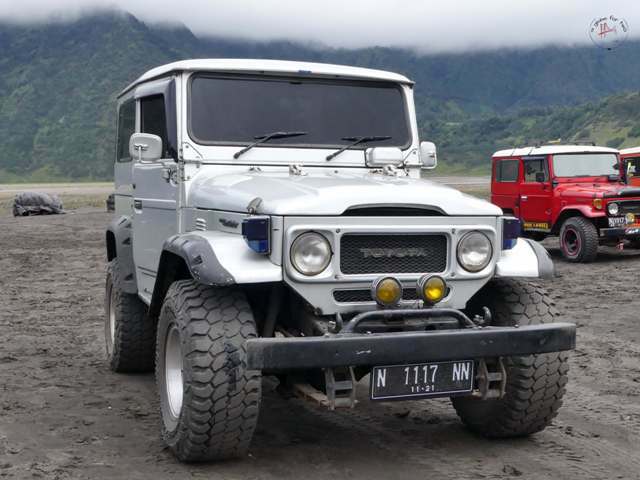 As you get closer to the mountain, you will reach the farthest point that jeeps provided by tour agencies can take you. From there it is still possible to jump on the back of a motorbike or a horse for the next part. 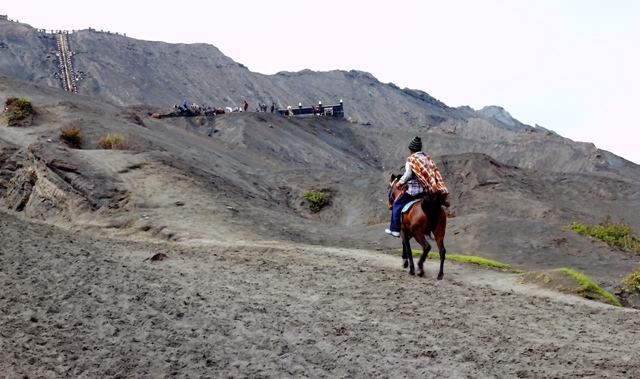 The motorbike will have to drop you off at the foot of the volcano, whereas the horse can carry you up the most tiring part of the hike. But even the horse will have to call it quits at the bottom of the staircase, which has been built halfway up the mountain to make the steepest part more accessible. 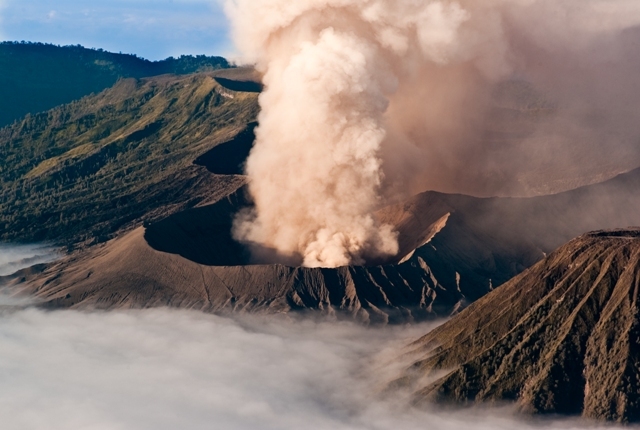 Once at the top you will be able to look down into the volcano, which, in the morning, will constantly unleash massive amounts of smoke containing sulfurous particles. On a day with normal winds you will be able to witness it from a far enough distance to not be affected by it. After you feel you have taken out enough time to behold this amazing sight, you will still be able to make it back to your hotel in time for breakfast. 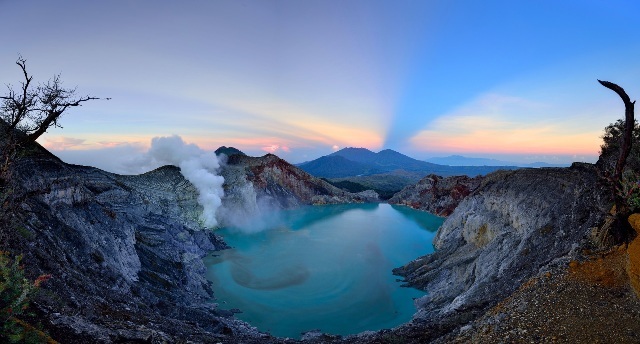 A whole different kind of volcanic experience can be found around the easternmost point of Java. 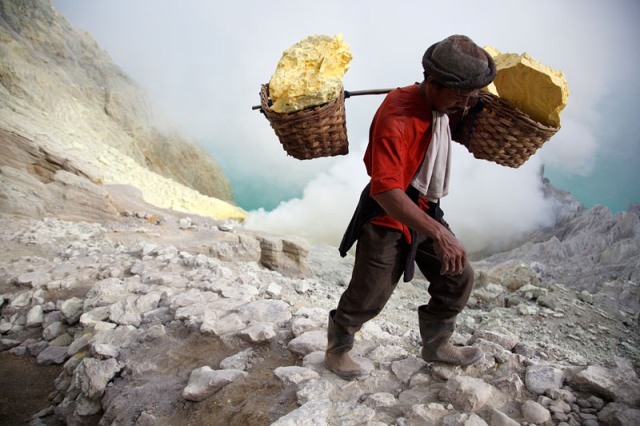 Ijen is a volcano complex that contains a kilometer-wide turquoise colored acidic lake, which is the site where sulfur miners make their living. Tours up and into the mountain depart as early as 1AM. It takes a good two hours to reach the top in the dark and up to another hour to get into the crater where all the sulfur is collected. 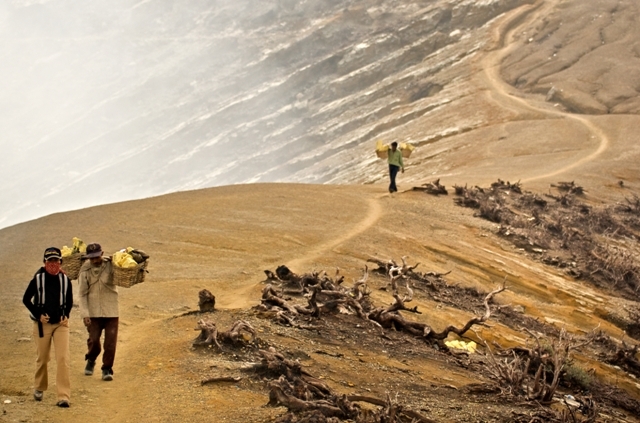 Be careful going down as the miners will frequently have to pass you to bring rocks of sulfur weighing up to 100kg to the rim of the volcano and down again to the village. The same route that cost us two hours of our time, carrying a mere 5kg of weight in our backpacks. You might think that the miners put in all this effort for a good living, but you would be wrong. These hard working men earn about $12 a day. 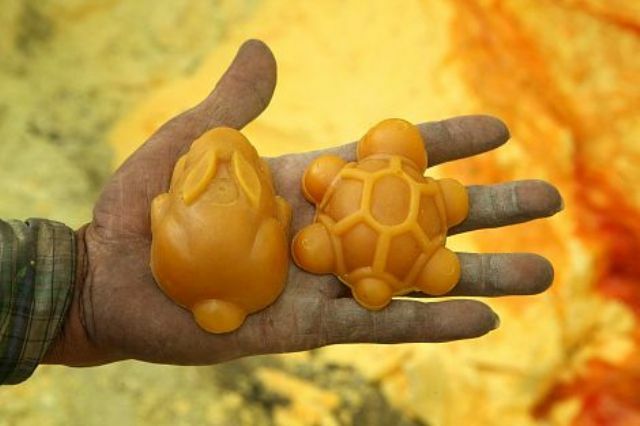 I would not have been able to help them bring down the sulfur, but I could help them a little bit by buying a small sulfur rock which they had pressed into the shape of a turtle. It was a nice reminder of our big effort climbing the mountain and made the working day of the miner a bit more worthwhile. One of the main reasons for us to put in all this effort was to witness the imposing blue fire that is created by ignited sulfuric gas. This also means that you will want to wear a gasmask. Sulfuric gas is not good for you, especially your respiratory system. The blue fire is a fascinating phenomenon and not something that you will be able to see just anywhere. By the time you are back on the rim of the volcano the sun will probably have begun to rise, which clears the air for you to set your eyes on the beautiful blue lake. 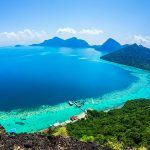 Although the climb itself will cost you considerable effort, the base of the mountain can easily be reached from Banyuwangi, which is accessible by train from Probolinggo, although most tour operators prefer to bring you over windy mountain roads by bus to a village west of Ijen. 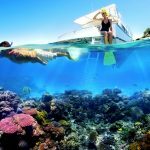 From Banyuwangi it’s a short ferry ride, followed by a four hour bus ride to the nearest airporton Bali, and which you could certainly use as an excuse to enjoy some of the beautiful beaches that Bali has in abundance to revive yourself from your mountain climbing adventures on Java. 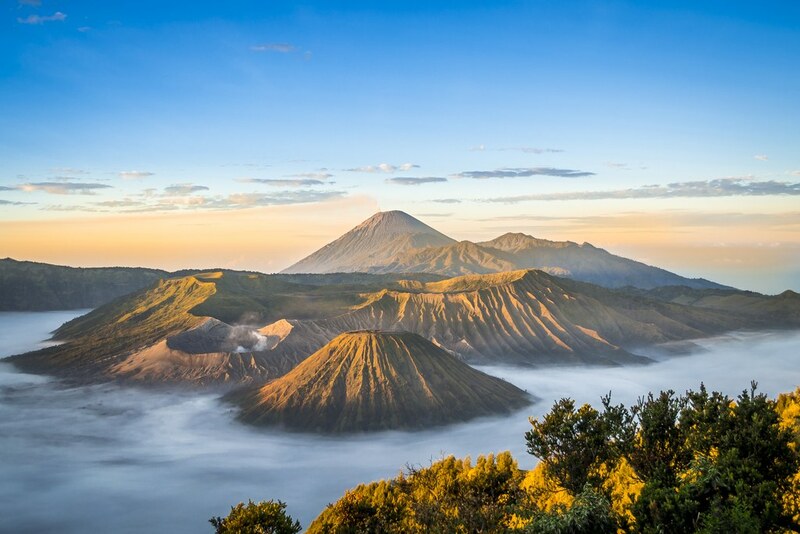 Flying from Vietnam to Yogyakarta usually comes with a stopover, often in Kuala Lumpur or Singapore. Air Asia flies these routes frequently. The dry season spans from May to September. October to April is considered the wet season. Although Indonesia enjoys warm weather throughout the year, higher in the mountains it can get chilly at night time, so warm clothing is recommended for your hikes. Indonesia has the largest Muslim population in the world. Shorts and t-shirts are not frowned upon for both men and women, but appropriate clothing is appreciated. Note: Mount Bromo and Ijen are active volcanoes with semi-regular eruptions, so it’s wise to be well informed before putting in the time and effort to get there and be sure that the volcano is approachable.